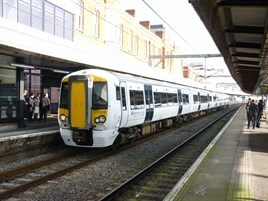 The rail industry’s Long Term Passenger Rolling Stock Strategy for the Rail Industry, published on March 3, says the current traction mix on Britain’s railways will change dramatically, with the current 3,909 diesel vehicles likely to shrink to just 1,234 in 2044’s medium forecast, and 95% of the fleet of 25,084 vehicles electric or dual mode. A long-term electrification programme would, the study says, release ‘good mid-life’ diesel units to increase capacity on routes which are likely to need self-powered trains. Even the worst case scenario suggests that 62% of track miles will be electrified by the end of Control Period 8 in 2034, while the best case presents a figure as high as 77%. In the medium case scenario, total rolling stock related savings could be £438m per year with 71% of track miles electrified. For more on this story, read RAIL 770, published on March 18.